Do you need to better organize, and increase your filing capacity without using additional office space? Would easier access to supplies and reference materials increase your productivity? 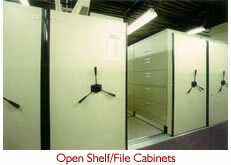 Do you need a cost effective way to increase space for storing archives? By using a mobile high density storage system you can dramatically increase your storage capacity by eliminating fixed aisle space between shelving. 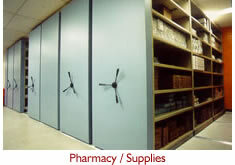 This allows you to store additional materials (up to 200%) in the same space, or store the same amount using less space. Storage for such items as files, books, archive boxes, office supplies,and even industrial applications can be achieved easily and inexpensively. Our carriages can be fitted with your existing shelving or we can design a completely new system to maximize your storage capacity. Our manual storage system is rated for 1,150 Ibs per linear foot. We disperse the weight better by installing a track under every upright so that there is less floor loading. With options for mechanical assist and shaft drive capabilities our systems can easily handle heavier payloads, in up to 32 feet in carriage length, with very little pressure needed to access a 36 inch aisle space. Movable lateral shelving increases capacity with the least disruption to operations. Storage capacity is typically increased 70-90% for a 2 deep system and 140-180% for a 3 deep system. The advantage of a lateral system is more of your materials are accessible at all times. Please Contact RTI with your Mobile Shelving questions and needs.